Abstract: More than one in ten accommodations in urban areas of the country is provided by employer (largely the government). These accommodations, along with privately rented and owner-occupied dwellings are sampled in consumer price index (CPI) to work out the change in price of housing service every month. For the government accommodations, house rent allowance (HRA) foregone is used as the rental cost. This paper discusses that using HRA foregone as a measure of house rent (a) does not capture true movement in price of housing services; and (b) causes substantial disturbance in measurement of monthly changes in headline CPI. To address this issue, this memo suggests alternative ways of measuring house rent in CPI. Consumer price index (CPI) inflation is the headline measure used by the Reserve Bank of India (RBI) for the conduct of monetary policy. In terms of the provisions of the RBI Act, the target for headline inflation is 4 per cent with a tolerance band of +/- 2 per cent. The implementation of the house rent allowance (HRA) award of the 7th Central Pay Commission (CPC) in July 2017 created an uptick in the headline inflation path from July 2017, the effect of which will take 18 months to dissipate. The Monetary Policy Committee decided to look through the direct first-round effect of HRA increase as this part of the increase was statistical. This is mainly because the increase was one-off and did not represent the monthly ‘change in price’ that the CPI intends to measure. This raises the question: should the housing index include HRA foregone by government employees as the rental price for government accommodation? If not, are there alternative ways to address this measurement issue so that headline CPI is free of such statistical blips? This memo discusses this issue and suggests alternative solutions. The international discussion on inclusion of housing services in CPI focusses on measurement of house rent considering two prime aspects. First, an individual may have rented an apartment privately from the market. According to the Practical Guide to Producing Consumer Price Indices (PGPCPI) by the United Nations.2 The rent to be recorded for CPI will be the amount that the household actually pays. The second aspect pertains to individuals who stay in their own house, that is, the owner-occupied households. Three different conceptual approaches are recommended by PGPCPI to measure the price of housing service for owner-occupied households: (i) the acquisitions approach – that measures purchasing price of such dwellings irrespective of how they are financed; (ii) the payments approach – this covers the expenditure actually incurred in occupying the houses, essentially the mortgage interest payments; and (iii) the rental equivalent or the user cost approach – this measures the housing cost as the rent the owner, as the tenant, notionally pays herself, as occupier. The main criticism of this approach according to PGPCPI itself is that “movements in rents may not shadow owner‐occupier costs. This is particularly so where rented housing and owner-occupier housing are distinct markets, … or in a different location, …”. However, PGPCPI recognises first, the conceptual attraction of using imputed rents, and second, the fact that compared with the other two methods, data can be readily drawn upon to construct the appropriate weights and index. It is interesting to note that in international guidance on measurement of house rent – such as in the international CPI Manual, 2004 or in PGPCPI – one does not per se come across discussions of employer provided households. Given the international backdrop, this section discusses two aspects of housing services in the Indian context – how house rent gets its weight in CPI; and how rental prices are measured. To identify an aggregate basket of goods and services that households consume in India, the National Sample Survey Office (NSSO) conducts quinquennially a nationwide household consumer expenditure survey (CES) with large samples. The monthly per capita expenditures (MPCE) of different commodity groups for the rural and urban population provided by CES are used as average representative basket consumed by a typical household for preparing the weighting diagram for CPI. In CES, house rent is covered under two heads – house rent (actual) and house rent (imputed). House rent (actual) is measured as (i) the rent tenants pay for privately rented households, and (ii) in case of quarters provided by the employer, the portion of monthly emoluments forfeited on account of occupation of quarters. House rent (imputed) is measured on the basis of prevailing rate of rent for similar houses in the locality or surrounding areas. Two aspects of house rent in CPI are discussed here. First, how the housing services weight is assigned in CPI. Second, how rental prices are measured. Actual rent paid: For the privately rented houses, CSO measures the actual rent paid by the tenant. HRA foregone: In the case of government provided accommodation, the rent includes the HRA surrendered plus the licence fee paid by the occupant. Rental equivalent: For imputing the rent of owner-occupied housing, the market rent payable on accommodation of same type is used (based on the prices already collected under ‘a’ above). It is interesting to note that several countries, as also India, uses rental equivalent for owner-occupied housing despite following limitations: (i) identical properties in immediate neighbourhood may not be available; (ii) the amenities in the two types of properties may not be similar; (iii) the room sizes may not be identical; and, (iv) construction quality may not be comparable. House rent index is compiled by CSO using a chain-based method. As per this method, a sixth of the sample rented dwellings are surveyed in a month so that the entire sample of households is covered over a period of six months. Though a sixth of sample prices are new each month, the CSO uses full price data of the previous six months to compile house rent index. There are some peculiarities in house rent thus measured for CPI that we discuss in the following section. CSO conducts longitudinal survey of a fixed panel of dwellings to collect rental prices for CPI. Of these dwellings, 13.7 per cent are employer provided, mostly by the Central government, State governments or public-sector undertakings (PSUs). Thus, house rent of these government provided households implicitly has a weight of 1.3 per cent in CPI (9.5 per cent weight or house rent in CPI and 13.7 per cent share). This weight is more than the weight of onion and tomato combined (1.22 per cent) in CPI, sudden movements in prices of which are known to cause considerable volatility in headline inflation prints. even the ‘nominal licence fee’ portion of rent – that depends on house and not employee – is reset only once in several years. The 7th CPC recommended revised salaries of Central government employees in the form of a pay matrix across different levels (Annex 1, Table 1). Given that the HRA for, say, Class X cities (i.e., cities with population of more than 50 lakhs) is 24 per cent of the Basic Pay, we can generate the corresponding HRA entitlements of Central government employees staying in Class X cities (Annex 1, Table 2). It can be seen from the table that in case an employee in, say, Level 9 is transferred or moves to her own house and the same house is occupied by another employee of, say, Level 6, then there will be a sharp decline in house rent (measured by HRA surrendered) for such a house, e.g., the HRA foregone for a given house may fall from ₹22,320 to ₹14,928. In another case, if a senior employee retires and her house is allocated to a younger employee in the same Level (e.g., Level 13 as highlighted in the Annex 1, Table 2), the HRA foregone for the house may fall from, say, ₹51,384 to ₹28,440. If such houses are in the sample of dwellings used to collect rental data, which is quite likely, it will cause abrupt change in data that does not represent actual movement in market rentals. Similar illustrations can be given for Class Y and Z cities. If we measure an increase or decrease in rent when there is a change in tenant of a privately rented house, then such changes reflect actual movements in market rent. However, the movements in rent of government dwelling due to change in resident, has no relation to actual change in rental prices. 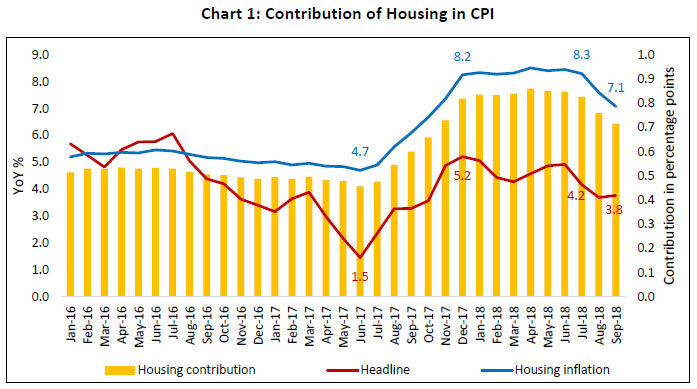 Fuelled by the 7th CPC HRA effect, housing inflation in CPI rose from 4.7 per cent in June 2017 to 8.2 per cent by December, hovered around that level in 2018 up to July before edging down in August and September as the HRA effect started to wane. Alongside the uptick in housing inflation, headline inflation edged up with the share of housing in headline inflation gradually rising from 0.5 percentage points in June 2017 by 35 basis points to 0.85 percentage points during January to July 2018 (Chart 1). 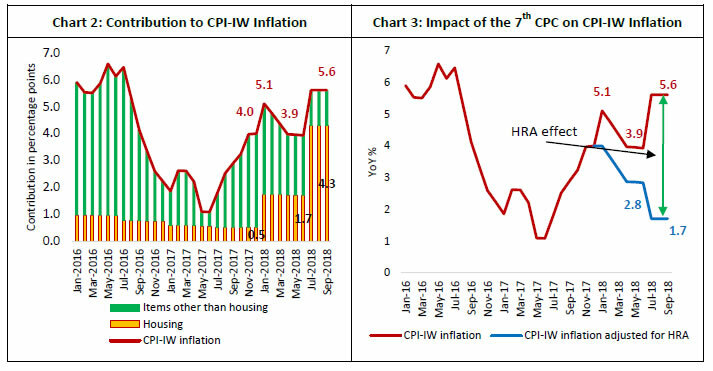 Following the 7th CPC HRA award, the share of housing in CPI-IW inflation rose in January 2018 and gained substantial proportion by July-August 2018 (Chart 2). Adjusting for the HRA effects, the July and August print of CPI-IW inflation at 5.6 per cent was markedly lower at 1.7 per cent (Chart 3). In the past, using this approach, it is seen that CPI-IW inflation was pushed up by 200 and 400 basis points following the 5th and 6th CPCs, respectively (Annex 2, Charts 1a and 1b). The spikes in inflation which take 18-24 months to smooth out are caused because the housing price in CPI is measured by using HRA foregone as rental equivalent. First, CPI is now the headline measure of inflation used for monetary policy. Such undulations in the CPI series create analytical and communication challenges, that can be avoided. Second, government provides partially subsidised accommodation to its employees by charging less than market rents. While for most of the CPI items, price paid by consumers is taken as price of the item; in case of government housing, change in the level of subsidy (arising from annual increments, promotions or changes in the employees’ remuneration package) is taken as price. attendant concern for the MPC to carefully assess its impact and look through such events. A larger challenge is created for policy makers to measure the suppressed inflation and gauge underlying true inflation. Thus, HRA foregone as a measure of rental price creates distortions in CPI inflation by pushing inflation up during years close to CPC revisions and keeping it suppressed during other times. While on an average over a decade it may appear to be okay, it may still be prudent to address such biases, with plausible solutions. Consumer price indices are constructed to measure monthly ‘changes in prices’ of a fixed consumption basket. The intention is to measure these price changes as efficiently as possible. The memo discusses that the decadal revisions in house rent allowances by the Central and State governments lead to large undulations in CPI inflation that cause analytical and communication issues for monetary policy. These changes in CPI emanate from the housing component since the sample of houses visited to collect rental information include, among others, government houses. Government dwellings are partially subsidised as employees have to forego HRA provided by the Government plus a nominal license fee as the notional rent. For subsidised items, the international manual PGPCPI provides two interpretations. First, all items that are fully subsidised should, in principle, be excluded from CPI. Second, for partially subsidised items (such as employer provided housing in the extant case), market related rates should be used to measure price changes rather than using the partial cost borne by the consumer (employee). Using an example of partially subsidised transport fares, PGPCPI suggests that “where fares are partially subsidised by the employer the CPI expenditure weights should reflect that element of the fare paid by the employee in the base period and the price index should only reflect changes in the fare tariff and not changes in the level of subsidy arising from changes in the employee’s remuneration package”. First, to arrive at the share of expenditure on housing, which is eventually used as weight for housing in CPI, NSSO uses actual rent paid for rented dwellings. In the case of employer provided dwellings, it is taken as the portion of monthly emoluments forfeited (HRA plus license fee). The weight of housing in CPI thus arrived from CES is correct and in consonance with PGPCPI principles. This practice should continue. Instead of collecting information on rent as HRA surrendered plus nominal licence fee charged from government households, we may use rental equivalent, i.e., market rent of similar dwellings in the neighbouring area. Alternately, use the nominal license fee that is charged by the government for rental equivalent. However, since license fee undergoes revisions only once in several years (the latest revision was in 2017 whereby the rates set in 2013 were revised), this does not qualify as the preferred option. In this connection, it is interesting to note that government charges market rent to its employees for overstaying in the government provided accommodation beyond their entitlement. So, the notion of market rent for government accommodations exists. For CPI, in the case of owner-occupied households rental equivalent is used, even though the owner-occupied houses and rented dwellings vary in terms of quality, amenities, room size, etc. Accordingly, extending the rental equivalent approach to employer provided dwellings may be explored. Third, in case house rent in CPI continues to measure HRA as equivalent for house rent, it may consider publishing house rent of government dwellings separately so as to facilitate assessment of underlying inflation dynamics for policy purpose. 1. NSS Report No.558, Household Consumption of Various Goods and Services in India, 2011-12. 2. Report of the Group of Technical Advisory Committee on Statistics of Prices and Cost of Living, Prices & Cost of Living Unit, National Accounts Division, Central Statistics Office, 2014. 3. Consumer Price Index Numbers for Industrial Workers (2001=100), Annual Report 2016, Labour Bureau, Ministry of Labour and Employment, Government of India. 4. Das, P. (2018), Impact of Increase in House Rent Allowance on CPI Inflation, Mint Street Memo, Reserve Bank of India. 1 Praggya Das is Director in the Monetary Policy Department, Reserve Bank of India (RBI). The views in this paper are those of the author and not necessarily of RBI. The author acknowledges the officials of Central Statistics Office, National Sample Survey Office and Labour Bureau for their valuable interactions. The errors, if any, are those of the author. 2 Practical Guide to Producing Consumer Price Indices, United Nations, International Labour Office, International Monetary Fund, Organisation of Economic Co-operation and Development, Statistics Office of the European Communities, World Bank and Office for National Statistics, United Kingdom, New York and Geneva, 2009. 3 HRA for PSUs and State government employees is fixed on the lines of Central government. Accordingly, in the rest of the paper, we use employer provided households and government provided households synonymously. 4 Housing has a weight of 15.3 per cent in CPI-IW. Report of the Index Review Committee, 2009, Ministry of Labour and Employment, Government of India indicates that the proportion of dwellings in sample provided by the government and PSUs is 34 per cent.